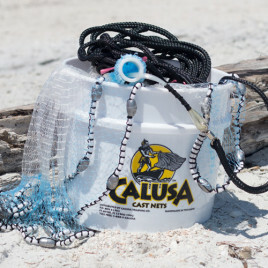 Ive been using Calusa Cast nets ever since Buster started the business . Ive tried others in the past and once you’ve thrown a Calusa net, you’ll never want anything else. Like they say, you get what you pay for, and Both Calusa and Cracker nets are as good as it gets when it comes to getting all the bait you’ll ever need. As long as you don’t get hooked up on any bridges, it will go the distance. I have used cast nets from many manufacturers, for many years. I grew up on the water on Florida’s Gulf Coast; fishing from New Port Richey to Clearwater. Throwing a cast net for live bait was part of the drill. I can honestly say that I’ve used a number of different nets from a number of different manufacturers. Nothing came close to a Calusa. Calusa’s slogan, “throw it, you’ll know it,” has more truth than most realize. These nets may cost more than most, but you are absolutely getting a quality product. One that will last for years. You can buy a cheap net, and have it last for one season; or you can buy a Calusa, take care of it, and have it for year(s) – PLURAL. Aside from quality construction with the best materials, they do indeed open easier, sink faster, allowing you to catch more bait quickly and spend more time fishing. Best cast net I’ve ever owned, HANDS DOWN!!!! This thing opens like a champ, super tough, and super soft. With it being tied at the bottom at every square, it hardly tangles. My first time out, I caught tons of bait on each cast, I even caught a small gag grouper, sail cats, needle fish, and bunch of other junk. The net is just amazing! ALSO, their customer service is amazing. I spoke to the guys on the phone and they are just incredible, I will never buy from another company again!